Blue Wren Financials interfaces with standard ERP, GL, and Payroll systems used in higher education, nonprofit, research hospitals, and independent research institutes to provide a more comprehensive financial management solution. It is specifically designed for fund accounting, grant accounting, and forecasting personnel costs. We have had a very positive experience with the implementation and use of the financial software. Pros: The grants financial package allows us to do "what if" scenarios as changes in grant personnel or other encumbrances occur. 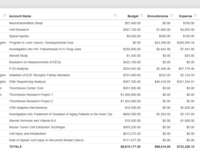 We have been able to eliminate our shadow spreadsheets we used to have to maintain in order to do accurate grant projections. Our install was complex, because we work with the entire College of Medicine (800 plus sponsored projects) and I wanted as little data entry as possible. We now import all of the data that we need from our current Peoplesoft financial and HR system directly into the software. We save hours on the data entry time we used to spend populating our speadsheets. The reporting options are many and varied and the reports are easy to read and interpret. Overall: My post award staff is able to spend time actually analyzing the financials and helping our investigator with their spending plans and less time keeping up separate spreadsheets. 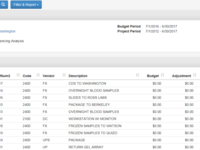 We are able to easily run reports by project and by PI on a monthly basis. We are also able to run roll up reports for department chairs so they can track faculty productivity. Blue Wren software is an excellent tool for our administrative team. 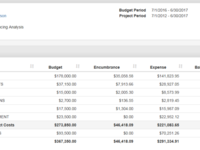 Pros: The ability to track expenses and produce reports in minutes. Blue Wren software is an excellent tool for our administrative team. The software includes all the necessary features that administrators need to manage grants, year end procedures and audits to name a few. The system is easy to use and helps us maintain information for the 8 different groups our team manages. It is critical that we have up to date / real time financial information the Blue Wren software makes this possible. Cons: The system does not create purchase orders or send automatic reports. We utilize these features within our University Purchasing system. Overall: We have the benefit of producing reports on the spot. We are able to maintain real time information on expenses verses income. The reports export easily. The Exported are in the University format so you will not need to spend time multiplying reports. The functionality of this product is exactly what we need! The service is also top notch! Pros: This product allows us to aggressively monitor on our account balances. There are numerous report formats provided that not only provide crucial financial data but also are easy to read. There are summary reports provided for our Board of Directors that need data at a high level. However, there are also much more detailed reports available for our end users that need to examine the data at a transaction level. The software also seamlessly interfaces with our General Ledger system eliminating the need for double entry and loss of personnel time. We can always count on timely and accurate service from knowledgeable staff on the Support and Implementation team at BlueWrenn. Cons: The system does not create real time purchase orders. However, we have a work around for that because our financial system can create those. Overall: It truly makes my job easier because of the account tracking and reporting capabilities! I have been using Department Manager for almost 15 years. This software makes my job easier. Pros: The Salary and Fringe Benefit projections is what I like most. I can run various projections for specific accounts, an entire lab, an entire program, or for one individual. The ability to use this rather than creating spreadsheets is very helpful when looking at past expenditures or preparing forecasts for a labs entire grant period. Cons: I cannot think of anything I like least about this software. There are have been a few processes that do not exist, but whenever we ask about them being added to the software the owner has been more than accommodating to implement changes requested. Overall: It is very helpful having the website access for our labs and customers to view the balances of their accounts, see the personnel, and view invoices for our service centers. We are in the process of implementing this program and I am very happy with the Blue Wren team. Pros: The Blue Wren team has gone above and beyond to assist us in getting set up with this financial software. There have been many bumps along the road from our organizations end and Blue Wren has been wonderful in providing information, answers and over all patience while we get to where we need to be in order to proceed. We are almost there and I could not be more excited to get this up and running as it is going to streamline our process tremendously. Cons: Reporting is not up and running during the our extended phase of transition and I am beyond eager to get into the reports to get first hand experience with them. It would be nice to see this functionality while in the setup process.